This week's featured teacher is Christina Hermer of Hanging Around in Primary. What is your favourite part about teaching? That every year is a new opportunity. I never teach the very same way year to year, my practice changes with the kids in front of me. I feel that I don't get "stale" because I am constantly changing it up. What is your best advice for a beginning teacher? You can't do it all perfectly, but you can do it all well. My advice is to focus on an area - like guided reading, for instance and learn everything you can and try out different practices to find what works for you. Once you feel like you have nailed that, then turn your attention to another area. Bit by bit you will get a great handle on teaching without being overwhelmed. 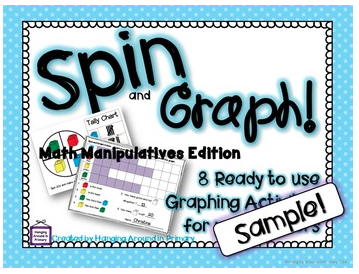 Christina would like to share her Spin and Graph Data Management Centers freebie from her TpT Store. You can download the file by clicking on the picture below. If you download the freebie, don't forget to leave Christina some feedback for her generosity. You can do this by clicking on "My Purchases" and finding the download in your "Free Downloads" tab. Don't forget to check out Christina's blog! She runs a weekly linky party called "Wish List Wednesday" where teachers link up sale products from their TpT stores and her most recent post showcases some of the amazing Canadian teachers on TpT. Thanks, Christina, for participating in this week's Feature Teacher! Looking for Canadian teaching resources? This week's linky party is all about Canadian resources, by and for Canadian teachers! If you link up, don't forget to leave a comment with a link back to your blog. I'd love to follow you on Bloglovin'. Thank you so much for the opportunity to be featured on your blog. I do hope your followers enjoy my freebie! Thanks for all of the great advice you shared!